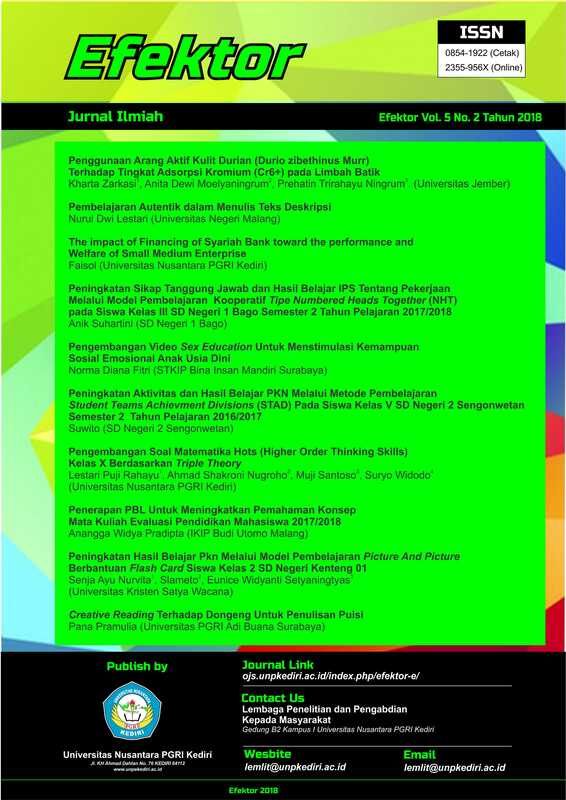 This study aims to improve the understanding of the concept of Educational Evaluation through the implementation of PBL (Problem-based learning),. This type of research is a classroom action research that includes 4 steps of activities in 1 cycle of planning, action, observation and reflection. The research subjects are and lecturers in the fourth semester of academic year 2016/2017. All are given action using PBL (Problem-based learning). Data collection techniques used were interviews, observations, and tests. 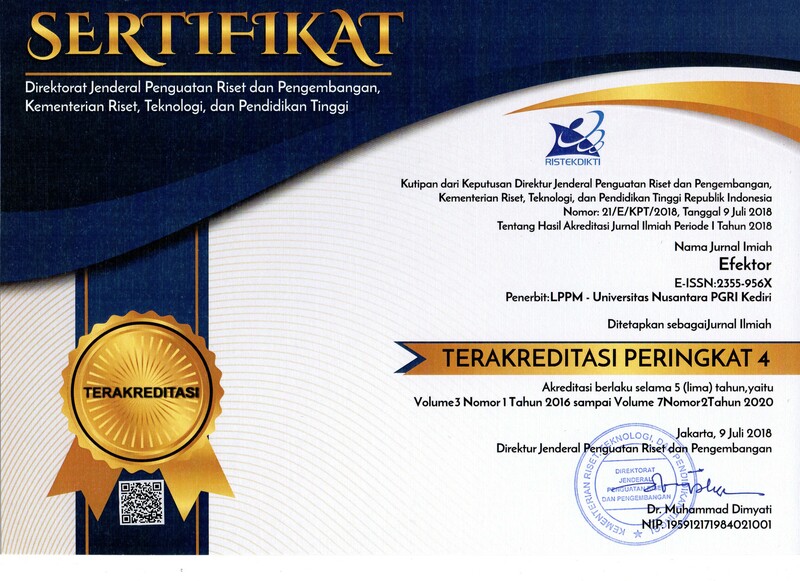 The results of this study indicate that the use of PBL (Problem-based learning) can improve the understanding of the concept of PJKR IKIP Budi Utomo Malang up to very good criteria in cycle III. Aspects of student concept comprehension increase from the average pre-action score of 56 to 84. PBL (Problem-based learning), Concept comprehension. Bloom, B.S. (1981). Taxonomy of educational objective the classification of educational goals. London: Longman. Budiningsih, A. (2005). Belajar dan pembelajaran. Jakarta: Rineka Cipta. Budiningsih, A. (2004). Karakteristik siswa. Yogyakarta: Fakultas Ilmu Pendidikan Universitas Negeri Yogyakarta. Kemmis, S., & McTaggart, R. (2000). Participatory action research. CA: Sage. Madya, S. (2009). Teori dan praktik penelitian tindakan. Bandung: Alfabeta. Sugiyono & Wibowo, E. 2003. Statistik untuk penelitian. Bandung: Alfabeta. Sugiyono. (2012). Metode penelitian kombinasi (mixed methods). Bandung: Alfabeta. Sumitro. (2004). Pengantar ilmu pendidikan. Yogyakarta: Fakultas Ilmu Pendidikan Universitas Negeri Yogyakarta. PRADIPTA, Anangga Widya. Penerapan PBL Untuk Meningkatkan Pemahaman Konsep Mata Kuliah Evaluasi Pendidikan Mahasiswa 2017/2018. Efektor, [S.l. ], v. 5, n. 2, p. 126-133, july 2018. ISSN 2355-956X. Available at: <http://ojs.unpkediri.ac.id/index.php/efektor-e/article/view/12306>. Date accessed: 25 apr. 2019. doi: https://doi.org/10.29407/e.v5i2.12306.